Since The University of Toledo introduced Lime scooters on Main Campus at the beginning of fall semester, more than 5,500 students, faculty and staff have logged more than 19,000 miles during the scooters’ first two months at UT. This usage translates to 12,700 driving miles avoided, saving approximately 533 gallons of gasoline and 17,200 pounds of carbon dioxide. The electric scooters were used for 32,000 trips, with the average UT trip distance totaling .42 miles. Brendan Wyatt hopped on a Lime scooter outside Memorial Field House. “We’re very pleased our campus community has embraced this new mode of micro transportation, which is more environmentally friendly and helps riders to navigate campus more easily,” President Sharon L. Gaber said. “Because the scooters were used so heavily within the first month of classes, we actually doubled the number available on Main Campus — from 125 to nearly 250 — to ensure we were meeting the high demand,” said Sherri Kaspar, director for parking and transportation. 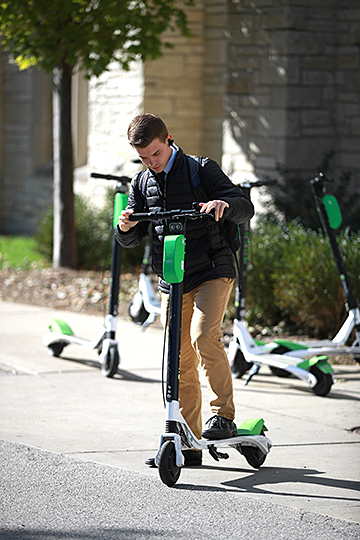 As a result of their heavy use, UT is among the top-performing universities in the U.S. for Lime scooter adoption. The California-based electric mobility company, Lime, provides its scooters in dozens of cities across the country and recently started international operations in France, Austria, Germany, Switzerland, Spain and Canada. Scooter users are reminded to follow safety guidelines provided on Lime’s website. Other helpful information — including the free, downloadable Lime app, instructions for use and UT-specific scooter guidelines — may be found on UT’s Parking and Transportation Services’ page about scooters. Due to colder temperatures and inclement winter weather conditions, Lime scooters will be removed from campus in November. They will return to campus in mid-March or whenever the weather no longer poses safety risks due to snow and icy roadways, Kaspar said. This entry was posted on Thursday, November 8th, 2018 at 3:12 am and is filed under UToday .